Following the tradition of throwing the bride's bouquet to determine which of the bridesmaid next to marry. At our wedding there was another interesting tradition that came to us just in America - the bride's garter to throw to identify the next candidate for marriage, but a male. This point can make a really interesting element of the wedding celebration. According to the North American tradition, the bride before the wedding dresses two garter, adorned with lace and sequins: one just above the knee right leg - is "happy" garter (it was her young husband throws her unmarried friends), and the other on the palm of the above - it's called "sweet" or "honey"and remains a memento of the wedding. Garter thrown before the bride's bouquet is thrown. all unmarried guests gather around the bride, seated (or standing) in the chair. The groom lifts the skirt a bit, do solemnly and slowly removes the garter hands (or teeth) and throws this piece toilet her unmarried friends! Caught, this modest piece toilet bride promises happiness, and early marriage. Cchastlivchiku, just to dance with a girl who catches the bridal bouquet the bride (or, if present at the wedding of his fiancee, he puts on leg garter girls, as a sign of their seriousness). Although this time the wedding party for the Americans is no less important than the first dance of the newlyweds, in fact, this ancient tradition of Western European roots - it was born from the belief that a particle of clothes the bride or groom will bring the house received a "celebratory trophy" luck and love. 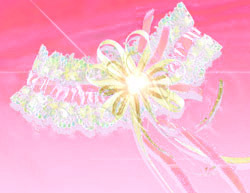 Toastmaster's Council: At modern Russian wedding is usually the bride's garter thrown after the bride's bouquet. The main element of this tradition - the definition of "lucky", which is to early marriage. It's your wedding, and how to play it up to you and only you. If you for some reason not suitable reproduction of this rite in the "American style", the groom may throw a flower from the bride's bouquet or his boutonniere .. But if you do decide to throw it a garter. Go for it! This scene is able to stir up all the male guests. May not be amiss to such advice to the groom: when removing the garter, then fall immediately find her, do not aimlessly trying to find a garter under many skirts brides - better to just ask the bride to help. Once you discover the coveted accessory, carefully straighten it by releasing the tension and slowly remove. If your fiancee has decided to put just two garter, do not confuse them: remove the need to lower. Perhaps the bride is too modest, then it may itself remove the garter ahead of time and deliver it directly to you. 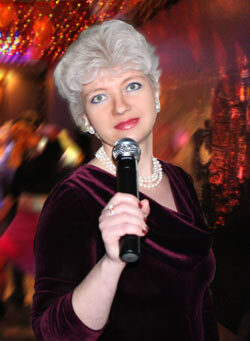 Back to page toastmaster-leading "Toastmaster-Leading"
Back to page "Russian Wedding Traditions"